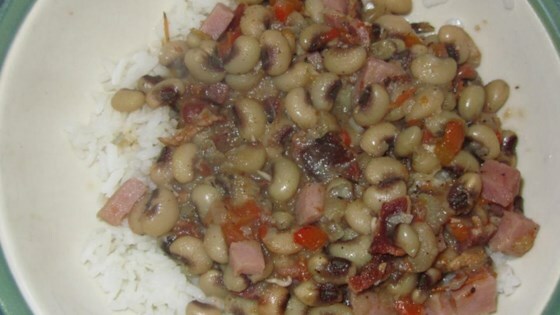 "Delicious seasoned peas cooked with onions, peppers, bacon, and ham. A New Orleans style dish. Serve over rice." Place bacon in a skillet over medium-high heat, and cook until evenly brown. Drain and crumble. Mix onion and green bell pepper into the skillet, and cook until tender. Stir in peas and water. Season with garlic powder, thyme, bay leaf, and seasoned salt. Bring to a boil. Reduce heat to low, and simmer 30 to 40 minutes, until peas are tender. Mix ham into the skillet. Adjust seasonings to taste. Continue cooking 5 minutes. Stir in fresh parsley just before serving. Wonderful. Full of flavor and easy to make. My 2 year old had 3 helpings! Everyone loved this recipe. We used fresh peas and chorizo from the farmer's market. The flavors are absolutely out of this world. My 18 year old said it was wonderful.